Sibericat is a small family cattery located in Port Hope Ontario specializing in the pointed Siberian or as many know them Neva Masquerade. All of our cats live as part of the family and interact daily with dogs, people and other cats. We also have a rescue cat who has been with us for 15 years. It is believed that Siberians are hypoallergenic and are well suited for individuals with mild to severe allergies to cats. Dave and I are now retired and love the freedom. I was a nurse for many years as well as a training manager for long term care in two municipalities in Ontario. Dave worked for public transit for 43 years and now drives school bus part time. Thanks to the hard work and high standards of my good friend Chloe, we have been fortunate to work closely with her to understand the breed and learn some best practices in breeding. 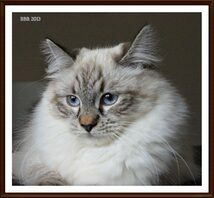 All of our original cats were imported from Russia to maintain the integrity of the breed. All of our current breeding cats are direct descendants of these original cats. Sibericat raises our kittens underfoot and ensures they are well socialised before leaving for their forever homes. We strongly believe in providing our customers the best pets to meet their family's needs. We believe we should test all of our kittens for their allergen levels so new owners can feel comfortable that they will be safe with our cats. Our primary goal is to produce low allergen level kittens that will fit into families with individuals suffering from cat allergies. All of our kittens are tested for FelD1 levels at 12 weeks old. This enables us to match the kitten to the right family for a lasting relationship. Our kittens are in homes across Canada, in France, the USA and we currently have people waiting for kittens in Brazil and Hong Kong.